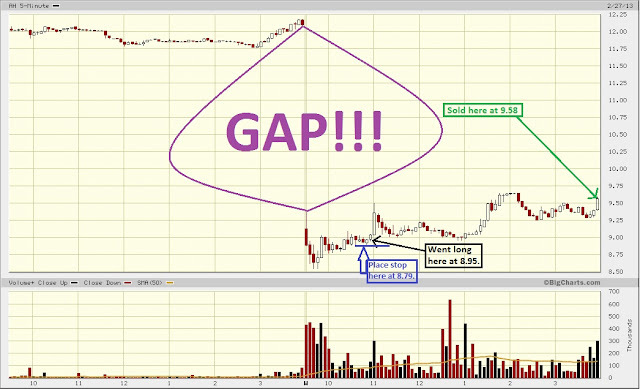 TRADER 9: Trade of the day, AH!!! So went long 1000 shares of AH at 8.95, after I couldn't find an entry signal when trying to catch the bottom 15 minutes after it opened. I finally did decide to try and take the temporary break-out around 9 dollars a share. Right after I got in, I could have sold it 5 minutes later and just taken a $500 profit when it jumped quickly to 9.50 in less than 5 minutes, but got greedy instead and waited about 2 minutes before the market closed and sold it at 9.58 for a .63 point gain.